In Earth orbit, a space telescope is free from any absorption or disturbances from the Earth’s atmosphere. Therefore, a large space telescope is planned for the future. We discuss the assembly of a large telescope reflector performed by a robot arm. For the assembly work, positioning of the arm using visual servo control to colored markers is proposed. A ground test-bed is used to test the characteristics of the new image processing method for colored markers. The results of the tests are also given. S. Nishida and R. Okamura, “Onboard Assembling of Large Space Reflector by Space Robot,” Space Factory on ISS Workshop, 1999. S. Nishida, H. Ueno, et al., “Structure for on-orbit assembly by space robot,” The 45th space-science symposium, 2001. M. Oda, S. Nishida, et al., “Components and Control System of ETS-VII Robot Experiment Subsystem,” ICAR99, 1999. M. Oda, S. Nishida, et al., “Onboard Local Compensation on ETS-VII Space Robot Teleoperation,” AIM’99, Atlanta, 1999. S. Kimura and S. Tsuchiya, “Antenna-assembly experiments using ETS-VII,” Proc. Of i-SAIRAS’99 (ESA-SP-440), pp. 307-313, Quebec, 1999. K. Matsumoto, S. Wakabayashi, et al., “Teleoperation Control of ETS-7 Robot Arm for on-Orbit Truss Construction,” Proc. of i-SAIRAS’99, pp. 313-318, Quebec, 1999. N. Sato and Y. Wakabayashi, “JEMRMS Design Features and Topics from Testing,” i-SAIRAS-2001, AS007, 2001. H. Kamimura, S. Nishida, and S. Kawamoto, “Recognition and Attitude Estimation of a Colored Object Ejected from m-LabSat,” IAC2003, 2003. Y. Fukuda, K. Machida, S. Nishida, et al., “Assembly Experiment of Microsatellite by Space Maintenance Robot,” i-SAIRAS 2001, Quebec, 2001. Y. Watanabe, T. Komuro, S. Kagami, and M. Ishikawa, “Multi-Target Tracking Using a Vision Chip and its Applications to Real-Time Visual Measurement,” J. of Robotics and Mechatronics, Vol.17, No.2, pp. 121-129, 2005. S. Nishida and T. Yoshikawa, “Onboard Assembling of Large Space Structure by Torque Controlled Space Robot,” SPIE S&S, San-Diego, 2003. 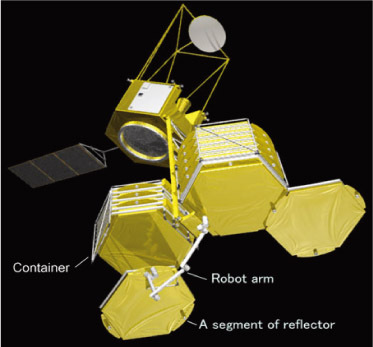 S. Nishida and T. Yoshikawa, “Reflector Assembling in orbit by a Joint Torque Controlled Space Robot,” ISR2004, Paris, 2004. S. Nishida, H. Kamimura, et al., “A Plan for Lunar Outpost Construction by using Robots,” Space2011, Long-Beach, 2011.